The British Columbia Sustainable Energy Association (BCSEA) organizes a series of free seminars on climate change and sustainability issues. BCSEA was founded by Guy Dauncey. On February 11th, 2014 BCSEA held a webinar on the recent work done by the Carbon Tracker Initative. Guy has written a detailed summary of their recent work on the BCSEA webpage. The seminar starts at 8:30 minutes and a very good Q&A session begins at 39 minutes. The slides that accompany the seminar can be downloaded here. The presenter is Mark Campanale, the founder and executive director of the Carbon Tracker Initiative. The ideas that came out of the Carbon Tracker Initiative were given prominence in Bill McKibben’s Rolling Stone article Global Warming’s Terrifying New Math. Their work has concentrated minds on the contradiction between climate policies and market valuations, and has focussed the attention of the big, long-term investors like pension funds, on the sustainability of their portfolios and on their methodologies of assessing value in the light of inevitable, if unduly delayed, carbon policies. 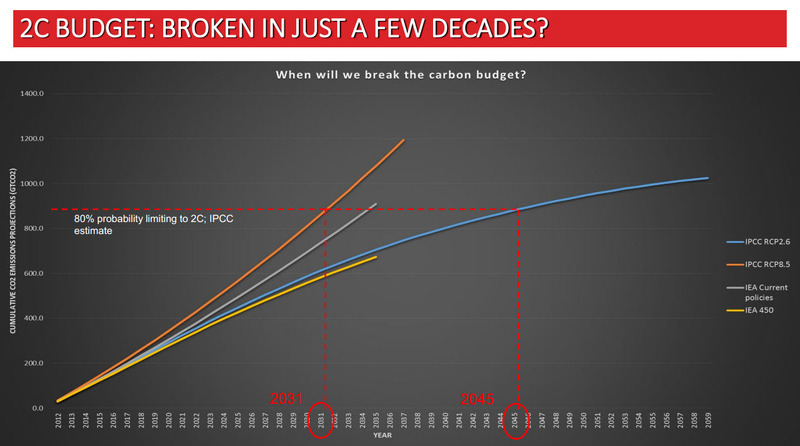 If we set our emissions budget to achieve an 80% chance of staying below the 2°C target, then on a business-as-usual path, we will have used up that budget in the 2030’s and on aggressive mitigation pathways, in the 2040’s. Which is a roundabout way of saying—after twenty fruitless COP meetings over the past nineteen years—that the2°C threshold is very likely to be breached. The world could be heading for a major economic crisis as stockmarkets inflate an investment bubble in fossil fuels to the tune of trillions of dollars, according to leading economists. We have always said that the bubble is a ‘carbon’ bubble (which is the title of the report) and it is to be seen whether there is a ‘financial’ bubble. The two don’t necessarily have to follow. A lot depends on how quickly the market responds to policy signals. What I mean here is that there are fossil fuel companies whose valuations are supported by the market’s belief that the demand for fossil fuels will remain the same, untouched by climate (or other) regulations and actually continue to grow. If this assumption is wrong – demand falls – then there are strong arguments to show these companies are overvalued. This is what HSBC have done, others are now doing. There are some graphs (not in my presentation) which shows how far out into the future you can go, to find how much of the stock price today is backed up by future earnings. In the case of oil, it is actually relatively high. So we can’t dismiss the financial bubble arguments completely. There are lots of variations of demand/supply and price, as well as cost of production, that will vary. 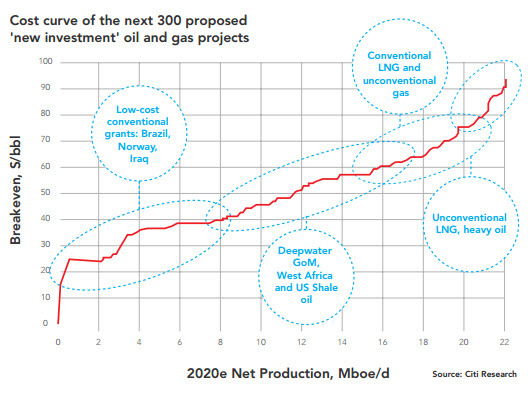 We have a far greater concern that $7 trillion of capex proposed by the fossil fuel industry (just listed companies) could lead to the stranding of assets – namely redundant rigs, mines, infrastructure such as coal ports/rail. Even if these did become “stranded assets” and have to be written down or written off, it doesn’t necessarily follow that there will be a financial crisis as a consequence. Markets are used to +20% or -20% swings in the valuation of companies without there being a ‘crisis’. To be clear, in the scenarios I played out – there is potential for financial collapse; these scenarios go along with civilisation (as we know it) collapse. The obvious one is where nothing happens in climate policy, there are no restrictions on emissions – and we run towards 3, 4 or even 5 degrees of warming. There, the science tells us that major changes to weather patterns (floods, hurricanes, droughts, higher temperatures) combined with rising sea levels, will make any business or investment of any description unworkable. In this scenario politicians panic and regulate overnight, leading to a chaotic transition to lower carbon energy and substantial financial dislocation. What Carbon Tracker is seeking is a gradual winding down of unmitigated coal firing and oil that takes us outside of the carbon budget. Capital saved would go to higher dividends as these companies quickly unwind, freeing up cash to be invested in alternatives. There, there would be no financial collapse – though financial risk profiling of companies in the energy sector (volatility of earnings etc) might rise. Just because x% of the fossil fuel resources need to remain in the ground does not imply that x% of a corporation’s stock market valuations will be immediately wiped out once prudent climate policies are (finally) introduced. 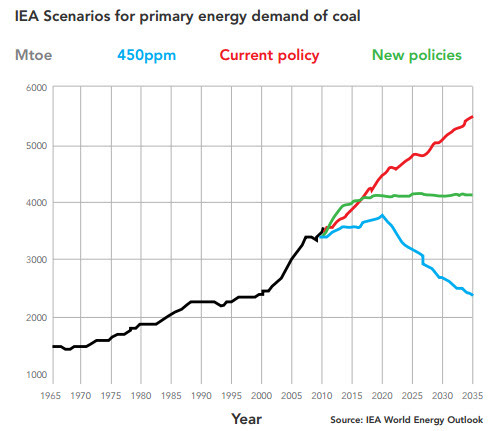 Any realistic transition away from fossil fuels will take decades. Companies are not so much valued on their assets, but rather, among other things, on the discounted cash flows anticipated to come from those assets. The reserves that will have to be left in the ground after a few decades, after the transition is complete, are already heavily financially discounted. To take a simplified example, an asset with an expected constant production and cashflow over 50 years would retain about 82% of its discounted value (using a discount rate of 8%) if its lifetimewere restricted to just 20 years, even though this would imply producing only 40% of its reserves. Economist Richard Tol has previously made similar arguments about the improbability of a bursting financial bubble resulting from the introduction of climate policies, with which I largely agree. Such a sanguine outlook should, however, be tempered by the fact that economists and businessmen have a far-from-perfect track record in identifying the inflating—and inevitable bursting—of financial bubbles, except, of course, in hindsight. John Kay, an economist and Financial Times columnist, wrote an essay, The Map is Not the Territory, that is highly critical of the economics profession and its fascination with unrealistic models. Kay accused economists in 2008, of “obsessively playing Grand Theft Auto while the world around them was falling apart”. Irrationally optimistic or pessimistic, “inefficient” market evaluations do happen despite theory and, as the formerly respected science writer and bank chairman, the 5th Viscount Ridley put it, a prized business model can be “hit by an unexpected and unpredictable concatenation of events”. As Ridley learned from the sudden collapse of his bank, virtuous circles can rapidly turn vicious once a few boundary conditions change. It does not help that participants in markets and businesses often adopt a certain groupthink, a mentality that downplays or ignores systemic risks, even as those threats may be obvious to outsiders. We can make rational arguments that the unwinding of the fossil fuel business will be orderly, but the degree of change required to decarbonize our economy is so huge and the time frame so short that nobody can really be sure that there will not be crises along the way. That’s all the more reason to get started on it sooner, rather than later. Once it becomes obvious to fossil-fuel companies that the sun is setting on cost-free carbon emissions, they will look for strategies to mitigate or offset their corporate decline. Apart from their future cashflows and capital assets, fossil-fuel companies are also valued for their technical and project-management expertise and it is probable that many companies would try to redeploy this expertise in new projects. For example, oil and gas companies may be able to extend their useful lives through carbon capture and storage (CCS), leveraging their technical abilities in managing fluids in the subsurface. In this way, they could extract profits, not only in return for their traditional expertise in getting carbon out of the ground, but also—in a new emissions-constrained world—for putting it back in. 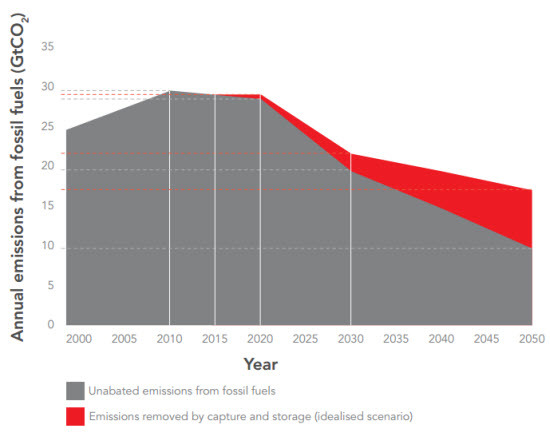 Shown is the carbon budget for a two-degree scenario, with the red slice showing very aggressive deployment of CCS (some 3800 plants in 2050, compared to 16 today), expanding the carbon budget by just 12-14%. As we have discussed, the latest version of the Carbon Tracker report does not stress so much the risk of an imminent global financial collapse but, instead, foresees—or at least hopes for—a more orderly unwinding of fossil companies as they divert funds away from long-term capital investments in carbon fuels towards greater dividends for shareholders and reinvestment elsewhere. But that unwinding will come sooner and be felt more painfully in some sectors than in others. As carbon taxes reduce demand and reduce the prices captured by producers, the first oil and gas projects to drop off the cost curve as the unwinding commences will be the more expensive and carbon-intensive ones, like the Alberta oil sands. The matrix shows the effect of a carbon tax of an oil sands project that has an 12.5% internal rate of return before carbon taxes are applied. The top row of results (0%) shows the effect of taxing only the upstream (production) emissions. Other rows show the effect of also gradually applying a given carbon price to all emissions, including combustion emissions.The average cost of capital for petroleum producers is currently about 9%. Table by Andrew Leach. Even if financial markets do not face imminent catastrophe, perhaps a more serious and certain consequence of the deflation of the carbon bubble will be the localized damage inflicted on countries and regions that have become used to living off of fossil fuel rents; for example, in the Middle East, Russia, Venezuela and Norway, as well as parts of Canada, the USA and Australia. The unwinding of private-sector corporations over a generation will be painless compared to the social dislocation that entire populations will suffer as they are forced to find new ways of making a living. Governments and state-controlled companies are by far the biggest owners and beneficiaries of fossil fuel production. I hope that future Carbon Tracker Initiative will look more closely at the political consequences of deflating the carbon bubble. To be sure, the royalty-rent-dependent governments are already mobilized to delay the introduction of emissions-reduction policies. The great benefit of the Carbon Tracker Initiative is that it confronts investors, policy makers and businessmen with the incompatibility of business-as-usual assumptions in relation to the requirements of necessary policies to limit dangerous climate change.Exxon-Mobil has recently announced that it will now be disclosing the exposure of its business model to future carbon emission reductions policies. Such disclosure will allow investors to assess the risks posed by the carbon bubble to a corporation’s future. It will also focus the minds of corporate executives on finding ways to invest capital in more sustainable projects. Thanks to this work, numerous scientific studies (e.g., Allen et al., 2009) and Bill McKibben’s article Global Warming’s Terrifying New Math, we now know with confidencethat the biggest problem we face with our carbon-based energy supply is not that it is about to run out, but, rather, that we have much more of it than we can safely exploit. We are left with a simple mantra: we need to leave most of the fossil fuels in the ground. Acknowledgement is due to Mark Campanale for his help and to my colleague rustneversleeps for comments on an earlier draft. This entry was posted in Hard Science, Soft Science and tagged Carbon Tracker Initative, Economics, fossil fuels. Bookmark the permalink.